Water samples are collected daily from the farthest reaches of the distribution network and delivered to the Filtration Plant for analysis to assure that safe, pure water is available to all customers of the system. Do You Want a Lawn Meter? For those single family residential customers who use large volumes of water outdoors, where it does not enter the sanitary sewer system, the utility makes lawn meters available. Customers may purchase these meters for installation in the line that feeds their outside hose tap or irrigation system. Call Public Works at 906-228-0444 to schedule an appointment to have the water meter delivered to your home. The customer is responsible for the permit fee and plumbing charges. Utillity personnel will wire in the meter and perform an inspection. Multifamily and commercial properties may apply for lawn meters, but a variance from City Ordinance 48-118 is required. Lawn meters are the Utility's way of promoting a greener community. Do You Need a Water Meter or Are You Having a Problem With Your Current Meter? To schedule a service call contact Utility Billing at 228-0420. The office is staffed Monday through Friday from 7:30 am to 4:30 pm, Memorial Day to Labor Day, and from 8:00 am to 5:00 pm, Labor Day to Memorial Day, but for customer convenience service technicians are available from 6:30 am to 10:30 pm. To protect the water system and its customers from chemicals and other contaminants that might inadvertently be introduced into the water through customer plumbing are the responsibility of the Utility Inspector. Certain plumbing devices and configurations are required to keep the contaminants in boilers, irrigation systems, aspirators, chemical and recycle tanks and other water-fed devices from finding their way into the water system. The city is charged by State law with verifying that appropriate protection is in place and maintained on the customer's premises. If you have any questions concerning backflow protection contact the Utility Inspector at 228-0444. If installing an underground irrigation system, contact the Utility Inspector to schedule an on-site inspection of the backflow protection that must be a part of such systems. Water piping must be protected from freezing. Pipes in garages or crawl spaces should be protected with heat tapes or insulation. Storage tanks are also inspected regularly for security reasons. At approximately five-year intervals they are drained for internal inspection, cleaning, and repair. Tanks are "off limits" to the public. Please respect the security fences and report those who do not. Is Your Water Cloudy or Discolored? Utility maintenance personnel use hydrants to flush watermains in the City. Flushing helps to clear corrosion and other deposits from the pipes, and keep them delivering at maximum capacity. In unlooped sections of the system it draws fresh water into areas where low usage may allow it to become stagnant. Finally, flushing is one of the best tools for verifying that the pipe network is functioning properly and that an unseen problem has not compromised its performance. Personnel flush a different section of the system each year between June and September. The large volumes of water that are moved at high velocity can lead to some discoloration of the water that reaches nearby homes. It will usually clear after several minutes of running the tap wide open. If it does not clear, please call 906.228.0444. A permit and meter are required for all private use of fire hydrants in the city. The permits are available at the from the Public Works Department, please call 906.228.0444. Are You Having a Water Volume Issue? Many buildings in the Marquette area are plumbed with galvanized iron pipe. After 15 years of service, the carrying capacity of such pipe may be reduced by up to 50% by internal corrosion. Over longer periods, the capacity is further reduced and the supply may eventually prove inadequate for some appliances or families. Under such circumstances the service line from the main into the building, and sometimes the building's internal plumbing, may require replacement. If the volume of water available from your service seems inadequate, you may schedule an evaluation of its capacity by calling the city water distribution at 228-0444. Each year, several dozen of the worst service lines are replaced. The city will replace the portion of the line under the street right-of-way but requires property owners to install a new line from the property line to the meter. Type K copper tubing is used for the city's portion of the line with 1" diameter the minimum size installed. In response to recent concerns involving drinking water testing for lead and copper, the City of Marquette decided to perform lead and copper testing on water sources found at City facilities. Lead and copper testing at City facilities is not mandated by the rules and regulations promulgated under the Safe Drinking Water Act. Lead in drinking water is primarily from materials and components associated with service lines and home plumbing. Corrosion control in our water system is accomplished by adding sodium hydroxide, which raises the pH, making the water less aggressive and causes a coating to form on the pipe from the calcium carbonate in the water. This helps prevent lead from leaching into the water from the plumbing. City staff completed lead & copper testing of the water supply drawn from fixtures at City facilities including drinking fountains and select sinks during the months of September and October. 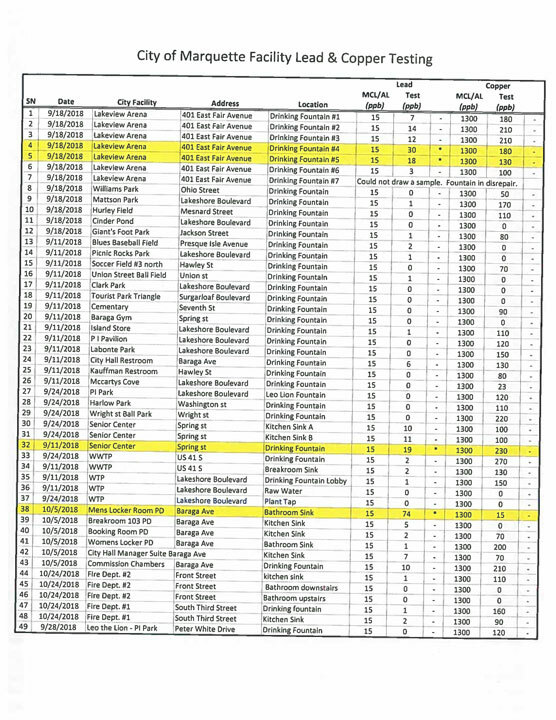 The fixtures tested were located at the Marquette Area Wastewater Treatment Facility, Water Filtration Plant, City Hall, including the Senior Center, Lakeview Arena, both Fire Departments, Park Cemetery and various City park facilities. In total, samples were collected from 48 fixtures. The Maximum Contaminant Level (MCL) for lead is 15 parts per billion (ppb) and the MCL for copper is 1300 parts per billion (ppb). A summary of all the results can be found on the City website. To date, we have had no test results that exceed recommended levels of lead. It should be noted that the raw water and plant tap were both tested at the Water Filtration Plant (WFP) and did not register and lead readings. The WFP would be considered the source water for the City water system. The four fixtures testing over the MCL included two drinking fountains at Lakeview Arena, a drinking fountain at the Senior Center and a hand sink in the Police Department locker room. There are seven total water fountains located at Lakeview Arena. The two fountains testing over the MCL are in the south hallway of the Russell Rink. These fountains are relatively low use fountains as they are not located near the locker rooms. The Friends of Lakeview Arena donated four filtered drinking fountains with bottle filling stations to the facility which City staff are currently installing. The drinking fountain at the Senior Center has since been replaced with a filtered drinking fountain with bottle filling station. The bathroom sink in the men’s locker room of the Marquette Police Department is designated as a non-potable water source. The sink will have the fixture replaced and will then be retested to determine inf the signage will stay or be removed.  The City of Marquette is responsible for providing high quality drinking water. The City is fully committed to ensuring the safety and welfare of the general public, specific user groups and staff who use City facilities.